We published an article about streaming on the PS4 and we couldn’t really leave out the Xbox One. After all, it is very similar to the PS4 in many ways, so similar content creation features aren’t much of a far cry. Some things will work differently on the Xbox One but you will quickly notice that much like on the PS4, if you want to start streaming or making content you wont need much more than what comes with a regular Xbox One. As with the PS4 article, I’ll be talking about utilizing what was available with my Xbox One. I got the Forza 6 Xbox which came with the system, a controller, and a microphone. My Xbox did not come with a Kinect but I’ll talk about how you can utilize it if you happen to have one. From a software perspective, all the tools I’ll be talking about are free. From a financial perspective, you’ll only have to really commit to buying the games you want to play but nothing production related. First, let’s start with streaming. Lot’s of people want to be streamers and the Xbox One makes it pretty easy to start. In comparison to the PS4, this is a little bit different and a bit more involved. 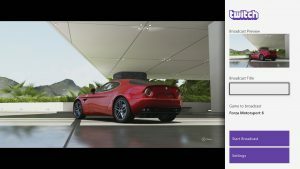 The Xbox One doesn’t have a Share button so to stream to Twitch, you have to use the Twitch app. You might normally snap in the Twitch app to just watch a stream but you can also use it to stream. 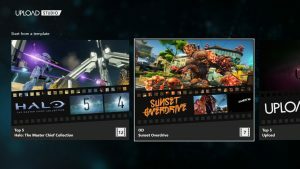 Once you select broadcast, you have a few options available like selecting your quality as per you internet limitations, set your stream info, and turn on your Kinect camera if you have it. Unlike on the PS4, you can’t make your broadcast show chat on stream, but you’ll still be able to read it on screen. If your chat is accessible to you from somewhere else, you can unsnap the Twitch app and it’ll be replaced by a lower third of sorts that just has your broadcasting status (like like “LIVE” or “LAGGING”) along with the amount of people watching. After that, you can just hit another button to start your broadcast. It’s really that easy. There aren’t advanced alerts like follow notifications and I don’t think it shows sub notifications. Streaming from the Xbox does have it’s benefits. You can dip your toes into streaming without paying potentially hundreds of dollars for a capture card and a setup you can stream with. Also, the Xbox One streams are put into their own category so there is the potential of a small bump by being in a smaller category of channels. There is sorting for Xbox streaming in Twitch but there isn’t an app that pulls every Xbox One stream into one place. This is probably because you can only stream to Twitch, which I’ll get into later. On top of just being in the Twitch app, your stream will also appear on various game pages on the Xbox so someone could stumble upon you stream from the Store page, for instance. I mentioned that you could only stream to Twitch from the Xbox One. This might not matter to you but many of the content creation features feel like they haven’t seen a major update since the launch of the console. Other streaming services do exist but you’re effectively cut off from them on the Xbox One. You could open up just about anything on the Edge browser app but a built-in app represents a deeper connection to another platform that is obviously not there for Hitbox, Beam, or even Youtube Gaming. The relevance of those services is up for debate but lacking updates in this regard means that looking forward to improvement of any meaningful kind might be out of the question. As with the PS4 article, it’s at this point that I say “There’s more to content creation than Twitch”. 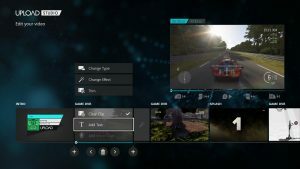 But before we get there, let’s talk about recording clips on the Xbox One. The PS4 has a share button that the Xbox doesn’t have. Instead, you shout “RECORD THAT” at your Xbox (Or double tap the guide button and hit the “Record that” button but shouting at your Xbox is probably more fun) and it records the last 5 minutes or whatever you set it to. 5 minutes for the clip is a bit short for my taste and that’s the longest it can be. Like the PS4, the Xbox doesn’t support just recording everything so collecting clips for whatever you make might be a bit harder with shorter clips. I wont pretend to know the technical limitations of this system so I wont say, “recording hours of video would be easy!” but a longer duration on a clip would be nice. Once you record a clip, they end up in the Game DVR app where you can look at them and manage them a little bit. You can just share these clips to your Xbox social feed thing or to Twitter. 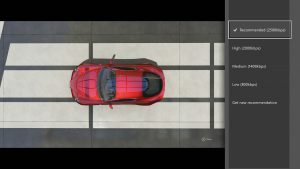 My main gripe with these clips is that in order to trim these clips at all, they have to go through an entire other app which feels very clunky when I know that on PS4, I can do basic cutting in the Capture Gallery. If you aren’t spoiled by the PS4, this might not be a problem but I am so it’s hard not to mention. But, what is this video editing app you mentioned, Mike? Well, it’s Upload Studio. Where the PS4 had SHAREfactory, the Xbox One has Upload Studio. 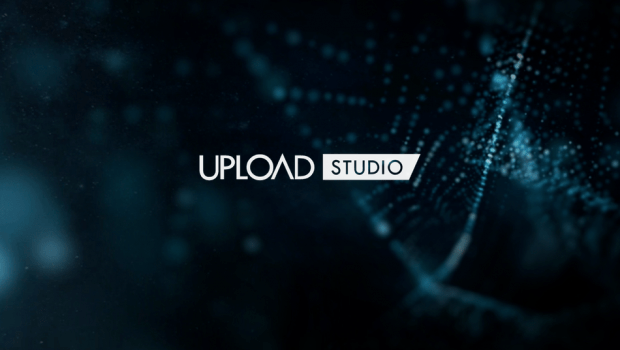 Upload Studio is your one-stop-shop for all video editing needs. Upload Studio does have some templates you can build off of but getting started from scratch is very easy. You add in the clips you want one at a time and trim them individually. The built in theme options have various intro, outro, and transition elements, there’s splash images for top 5 list-style videos, you can overlay some styled text, and there’s some picture in picture templates that can use a Kinect if you have one. Most of the different elements exist within a theme that you can’t really change. Regardless of if you just have a plain clip, an intro, a transition element, or a Kinect camera clip, you can add on text set to a specific style. This might seem a bit rigid, and if you have a stronger pre-existing sense of branding it is, this system makes it hard to make something that looks bad. The theme’s do all the work and you literally just cut a clip to a certain length and then hit “Complete”. If I haven’t said this before, I will now: Having a small pool of themes may make every video that comes out of Upload Studio look the same but it’s pretty good looking which means the bar of quality goes up overall. From there, any problems I really have with Upload Studio are nitpicks for the most part. Basic video editing options aren’t in Upload Studio like just splitting a clip and making two clips. You have to add in a clip, trim it, then add the same clip and trim out the beginning. The clips being only 5 minutes probably means that this doesn’t happen often but as a person that edits on Premiere, it feels like a basic feature. You can’t see the waveform for any audio, including voice-over which you can add in Upload Studio. This combined with the fact that voice-over is attached to the clip and not it’s own element makes editing voice-over a bit clunky overall. Like SHAREfactory, this is also a linear, single-timeline editing tool but for whatever reason, it seems more usable here. It might be because this doesn’t pretend to look like a piece of video editing software despite the fact that it definitely is one. The last thing is that there isn’t any kind of support for a music track so you’ll have to settle for the game audio with your voice if you so choose. 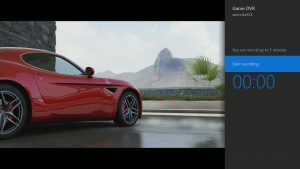 Once you finish your project in Upload Studio, you can share it to you Xbox One social feed and you can also upload it to your OneDrive where you can make further edits or upload to your video destination of choice. There aren’t any other real upload options beyond that, though, so to get a video onto Youtube, for instance, you’d have to save it to your OneDrive then upload it to Youtube from there. This is where I remind you that it feels like many of the content creation features haven’t had a major update since launch. While this is an impressive feature set, the themes are what define your videos and there isn’t really a system where you can expand on the themes. I can’t buy any and what’s there are for older games. Some are very general and you can use them for anything but then there’s Advanced Warfare, Sunset Overdrive, and Forza Horizon 2 which are not new. FINE. I’ll play your game. That about does it! This generation of consoles has honestly surprised me. The idea of making high-quality videos on my console would have made me laugh last generation but this generation is completely different. Now, you have the tools to make great looking streams and videos especially if you don’t have a lot of video editing chops or even access to a full video editing suite. The great thing is that even if you aren’t about making reviews, let’s play, streams, or anything else, these tools are great even for just sharing your favorite gaming moments.